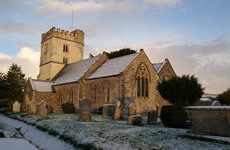 St. Giles's Church is part of the “Offwell” Benefice made of five parishes: Cotleigh, Farway, Northleigh, Offwell and Widworthy. Currently there are three services a month in Northleigh’s church (see below) we have introduced occasional non-eucharistic services on the 4th Sunday. There are links with Farway Parish Church and Farway Methodist Chapel including shared services. We think of ourselves as a warm and welcoming congregation, average number 15, drawn from a wide range of Christian traditions. Our worship style is probably best described as “traditional rural Anglicanism”. Northleigh’s Parish Electoral Roll is due for renewal this year. Anyone who wishes to be on the roll before the Annual PCC meeting must complete a new application. Blank forms may be downloaded here and are also obtainable from the Electoral Roll Officer, Antonia Goddard. After many years as a parish in the “Offwell” benefice, it has been agreed that Northleigh will become part of the “Holyford Mission Community” made up of the parishes of Colyton, Colyford, Branscombe, Musbury and Southleigh. The formalities of the process will take some time to complete but the new arrangement will take effect on an informal basis from January 2019. In earlier days, Northleigh had been part of the Colyton Team Ministry, sharing clergy with the parish of Southleigh as far back as the 1920’s. Times have changed considerably since then, but we are encouraged by the warm welcome we have received from the Holyford Mission Community and look forward to making our contribution to it’s future. 3rd Sunday in the month - no service. HC at 11:15 am at Farway or visit Holyford Mission website for other nearby services. Churchyard Records In common with many other rural parish cemeteries Northleigh's churchyard contains a wealth of local and family history, but as time and tempest take their toll of our ancestors’ graves there is a real risk of this history being lost forever. Click here to view our churchyard records site which seeks to provide a simple format for promoting awareness and interest in our past amongst local community and family historians. One of the unseen treasures of the church are four bells, but they are not unheard as they continue to be rung regularly. 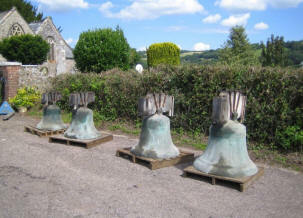 Cast in two different foundries in Exeter, the tenor in 1450 and the other three in 1490, Northleigh church bells form what is now the only complete ring of pre-reformation bells in Devon and one of only a few such rings in the country. Treble: "St Peter pray for us"
2nd: "With my living voice I drive away all hurtful things"
3rd & Tenor: "Upon me has been conferred that beloved name Jesus". Local bell practice - Thursday evenings at Farway. History from Saxon times to the present day Little is known of the earliest Christian presence in Northleigh. During Saxon times this area was served by the Minster church of Colyton and no reference to any church land in Northleigh is found in the Doomsday Book. Whether or not the Beer stone Font and Archway over the south door (both of Norman origin but considerably reworked) were from an existing church on this site, or taken from somewhere else is not known. It is possible that an earlier cob and thatch church was replaced by the present building in the late 14th century. The earliest recorded Rector was a Stephen Brente who received the living in 1349, an inauspicious time as England was then being decimated by the Black Death. The Nave of the church and Chancel were built in the 14th century. The North Aisle and side Chapel were added in the late 15th to early 16th century as was the Tower at the west end. By the 19th Century the church was reported as being "in a very dilapidated state" and a major programme of restoration was undertaken. The church register records that the work on the Beer stone windows was carried out by John Murch of Colyton, the masonry by John Hooper of Farway and the roof by Daniel Power of Colyton. On Thursday 9th September 1869 the church was reopened, the scene as described in a newspaper at that time was "..arches of evergreens and flowers spanned the road, flags floated from trees and every commanding spot, and mottoes expressive of Devonshire hospitality were prominently displayed. The villagers donned their Sunday clothes and a unanimous determination appeared to have been to make the day a holiday." At the time of these Victorian improvements and renovation the render was removed from the tower giving a much changed appearance to the church familiar to all for nearly 150 years. There was an unforeseen consequence to this work which also became familiar particularly to churchwardens throughout the 20th century - a wet Tower! The interior was frequently green with moss and sometimes ferns would grow from the stonework. At the end of that century the decision was taken to re-render the exterior of the Tower. The visual impact on the church and village was marked and difficult for many to accept but the Tower has dried out. Internally, for such a small parish, the church is rich in decorated features worked in both wood and glass. Pew Ends - The oak benches have a nearly complete set of richly carved late 15th century oak ends with scrolled foliage frames containing panels of various designs. Fascinating to look at and feel, they are all different. Pulpit - The octagonal oak drum pulpit is from the Jacobean period (early 1600's) with panelled sides carved as a blind arcade with flowers and a frieze carved with acanthus leaves and scrolls. North Aisle Screen - This square-headed oak screen of a similar age to the chancel screen would appear to have been moved from elsewhere and fitted into its present position. Of particular note are the painted vine leaf enrichments to the cornice. The earlier Jacobean altar table is found in the Lady Chapel, the present altar and screen behind it (the reredos) are of Victorian origin. The Windows - The large east window behind the Altar is from the 19th century but of more historical interest is the very fine ancient (medieval) glass in the east window of the North Aisle. The figures are of St Peter holding the key and St Paul holding a sword with the figure of an unknown Bishop with mitre and staff in the middle. Some have assumed it to be St Giles but this is unlikely as he was a Hermit who founded a monastery near Arles c.710. There is also some confusion as to the dedication of this church. According to a parish register of 1775 it was supposed to be dedicated to St James and that "in the memory of some ancient people there was a parish feast on St James day but disused for many years." Having stood through civil war, rebellion, and two world wars Northleigh’s parish church remains open to all: the visitor looking for a cool place to sit or shelter from the rain, the village to mark special or solemn occasions, or the individual just seeking a quiet place to think or pray. if you have local information you would like to see included in the site.